As soon as I saw the Liquid Sand varnishes I fell in love. I wanted them all as I saw them through a window of a closed beauty parlor. Just after they came out I heard very mixed views. 'It takes ages to get off', 'It's too gritty', 'It chips easy'. So for that reason I was very hesitant to grab a bottle. After seeing Holly Arabella's post on the mini pack, I had to have one. After heading to my nearest beauty outlet I picked up Get Your Number - The only one they had in stock - a gorgeous glittery blue. 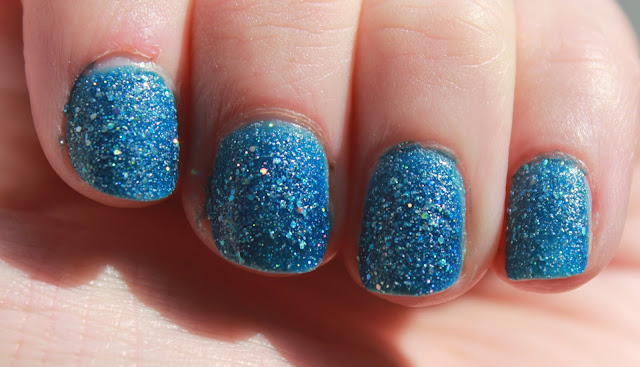 It's a beautiful blue with a slight green tone to it with hundreds of teeny tiny glitter pieces, and a hand full of small silver pieces which has a rainbow shimmer. This beautiful varnish says it needs 2 coats, but I needed 3 before I had the desired look. It goes on the nails so smoothly with no streaks, despite its gritty appearance. The dry time wasn't overly quick as I kept smudging it. I had to leave the varnish to dry for around 5 minutes before I braved another coat. This polish dries matte to really enhance those glitter pieces. Because of the amount of glitter in this polish, I really wasn't looking forward to removing it but to my surprise it came off pretty quickly - Much faster than some glittery polishes I own. I also noticed that it lasted around 4 days before it started chipping which I was impressed with! I am in love with this polish and I can't wait to pick up another shade from the Liquid Sand range. Because of its rough texture I know that this wont be for everyone. It took a while to get used too but surprisingly didn't annoy me at all. You can get this shade, along with the other 3 shades from the Mariah Carey collection at Beauty Bay for £11. Do you like the effect? I nearly bought some the other day and stopped myself, now im totally regretting it!! AH!! I need this in my life NOW! I love this so much it is so summery! I agree! :) Can't wait to rock it in the summer!